You quite often hear about people doing amazing things for good causes. Yet Myalgic Encephalomyelitis is not a disease that has had the privilege of attracting that kind of attention. Honestly, since there is so much controversy surrounding the disease, I guess it’s hard for people to take that extra step…to “Invest in ME”. Some people are probably not even aware that it’s really an actual disease. So it’s been quite something to get to know Mike Harley from Bristol. 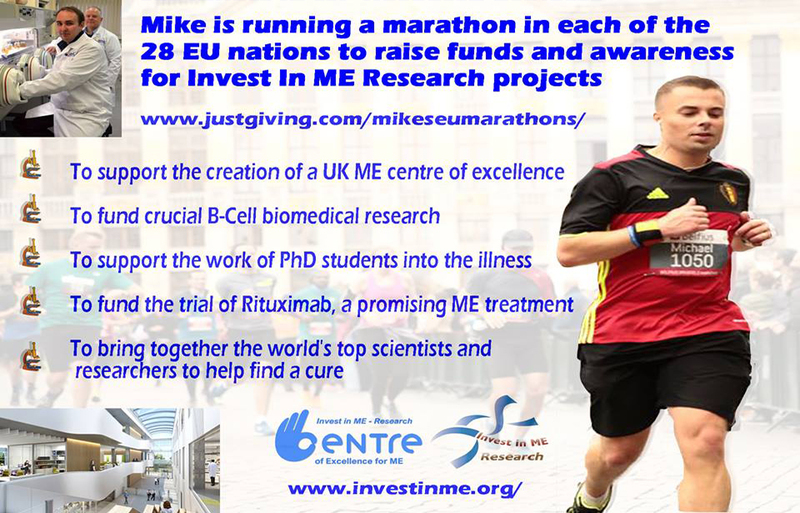 He’s running a marathon in every country in the EU, raising awareness and funds for Invest in ME, a UK charity promoting education and research for ME. What an amazing effort. Here’s my interview with someone I consider to be a true hero. Hi Mike, thanks for letting me interview you. I’ve been amazed by what you are doing for the ME community, I’m really very honoured that I get to ask you a few questions to get to know you a little better. I hope you will enjoy your stay in Amsterdam. 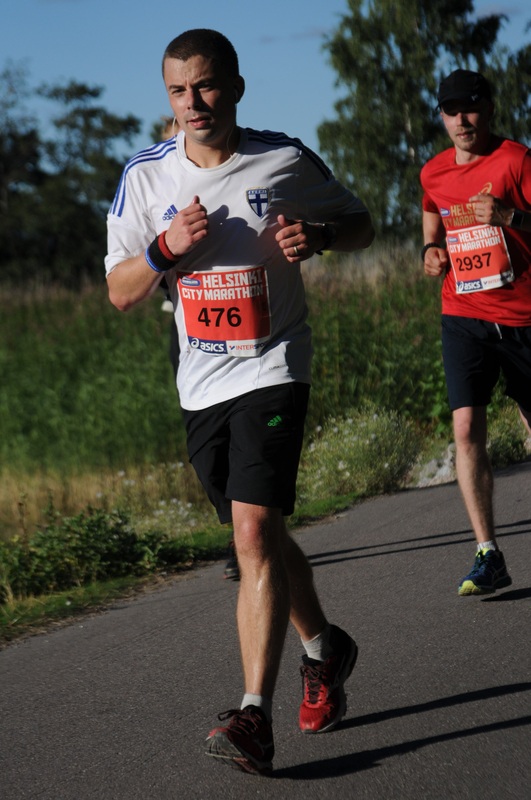 You’re doing a challenge where you are running in every European country. How did this challenge come about? Back in 2014 myself, my wife Cat and two mates (Mike and Raz) visited all 92 English Football Stadiums in 92 hours to raise money for Invest In ME –a voluntary run, biomedical research charity. We wanted to do something to help raise the profile of biomedical research into ME and money for a UK clinical trial for Rituximab. My friend Ian has had ME for over 10 years and when he told me about Invest In ME and a potential cure I was really keen to get involved to see if I could help. Anyway, after the ’92 Challenge’ was so successful (national TV coverage, radio etc), I didn’t want to stop helping all the amazing people we’d met on our journey. I ran a marathon back in 2001 when I was 18 and wanted to prove to myself that I could do another one (at the time being 32). What we found was really successful with the 92 challenge was the 92 different towns and cities could all use our story in their local media to raise money and support. If I was to do a number of marathons in different geographic areas that would maximise the chances to raise money and awareness. I decided to help the European ME Alliance (Invest In ME are a founding member) and at the same time satisfy my love of travelling around Europe by running abroad in multiple countries. If I could bring patients, researchers and charities together we could in theory push research through quicker to find treatments. 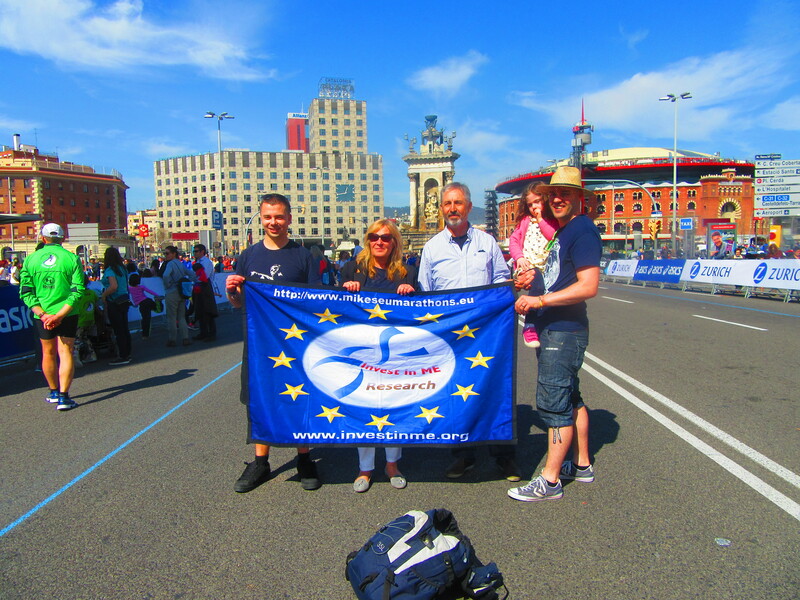 There are 44 European countries but not all have established marathon events which seemed like a wasted opportunity. I looked at the EU and all 28 countries had at least one decent sized race so the challenge was set! What does your friend who has ME think about the challenge? I know he’s very grateful, he’s been really helpful with some of the marketing tasks we’ve had to do and I hope he enjoys getting involved. I know most people might think I’m going ‘above and beyond’ but it’s not entirely selfless, I want to do this challenge for him, other patients and also myself. What does your wife think about the challenge? She’s happy to support me, she knows if I say I’m going to do something then I do it. She loves traveling too and although it does mean a lot of sacrifices, particularly when I disrupt plans when I need to run long on the weekend. Having experienced the 92 trip, however she’s as keen as I am to help out. Were you running before this challenge and does running come natural to you? Not really. I did London in 2001 and a couple of half marathons (badly) a few years ago but I’ve had to learn from scratch really. I’m not naturally athletic at all. I can manage pain well enough and have a stubborn streak so it seems like a decent fit for me at the moment. Do you need to run everyday to keep in shape? I run 3 times a week. I tried running more but I have a partially torn cruciate ligament so I have to be careful not to push it too hard. If it snaps that will be the end of my running days. I find that by eating sensibly and focusing on each run fully I can run just as well on a 3 day plan than 4 or 5. How is your body holding up? Generally OK I reckon. 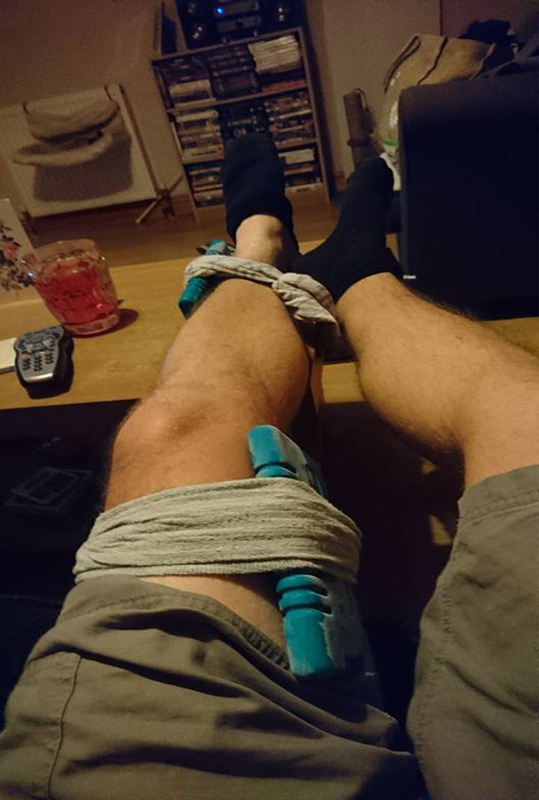 I’m nearly 3 years in and no major injuries yet, I think because I’m careful and recognise the importance of resting and stretching. I’d like to go quicker and always try to improve my times but have to remember I’m not in my 20’s anymore! What do you think about the situation in the UK concerning the treatment of ME patients? It’s clearly a very frustrating and negative situation. There seems to be a controlling influence from psychiatrists over the narrative and despite all the recent proof of how ineffective recommended treatments are they’re defending their positions hard out of professional pride. It’s clear to everyone that CBT and GET are dangerous and unsuccessful so I can see how patients get so angry; I’m angry for them. I find it hard to explain to friends who don’t know much about ME. I know patients who have been denied benefits and been accused of fabricating their illness, it’s truly awful but typical of what I’ve seen across Europe. The light at the end of the tunnel is the combined efforts of advocates, health journalists, scientists and pro-active charities like Invest In ME who are making progress and will do even more if we get behind them. You live in the Bristol area. The city where professor Esther Crawley works. What would you talk about if she would come and sit next to you on the bus? I’m not sure I could keep my cool. I’d certainly be challenging her on her Lightning process work on vulnerable children, maybe I’d try and drag her to see some of my severe ME patient friends so she could actually see the damage she’s doing. How many countries have you been so far and what has been your most memorable run or experience? I’ve been to 12 countries so far. My most memorable runs have generally been when I’ve met patients or charities the day before. It seems to give me a real boost. I’ve run well in Prague, Belgium, Ireland, Sweden, Finland and Spain when this has happened and made some great friends. 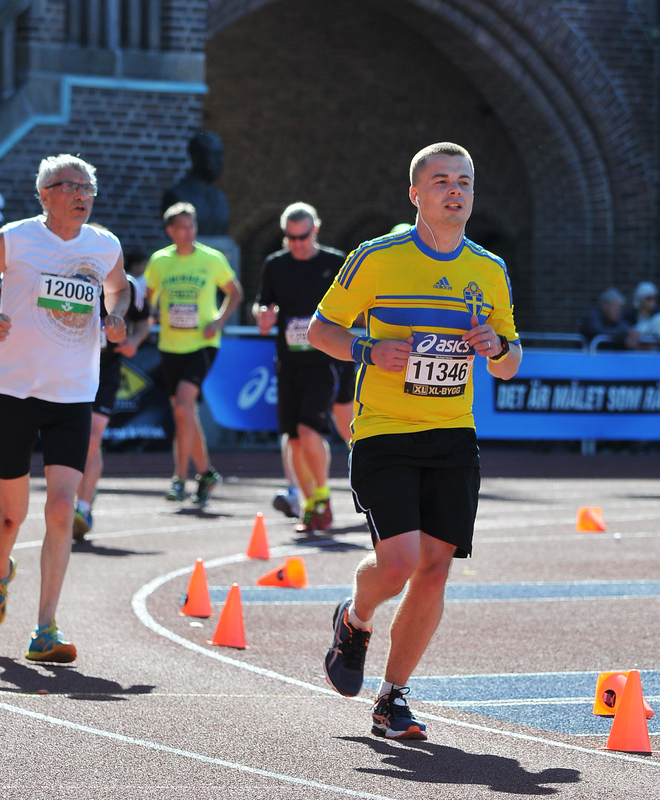 Finishing races in stadiums (Sweden, Finland) is always great and so is beating a personal best (Lithuania) but meeting people brings the trip alive for me. How many more countries do you still have to visit and which one is next? I’ve got 16 left, next up is Netherlands (Amsterdam) on October 15th. What are you hoping to achieve by doing this challenge? To raise the money needed to enable clinical trials and research and also to help raise the profile of ME as a physical illness in desperate need of biomedical research across Europe. If everyone adds a bit of pressure then governments will have no choice but to listen to us. What are your plans after you have finished the challenge? No idea, it might be running, it might not. I need to figure that out soon to avoid a huge mid-life crisis when this is over! Does this challenge take up a lot of your free time? Yep definitely. I’m lucky I don’t need too much time off work for it. The runs themselves are reasonably easy to fit in. That said, there’s a lot of work to be done contacting media, the marathon organisers, interviewing patients, contacting ME groups and social media stuff. But I’m happy to do it, if I didn’t I’d be annoyed that I wasn’t maximising the opportunity. I’m lucky to have some fantastic helpers too including Invest In ME, Nancy van Hoylaandt and Juli Persson. What sacrifices did you have to make to do this challenge? And from these challenges were there also some positives like drinking less, eating healthier? Yep there’s no doubt that I’ve changed to a healthier lifestyle. I would probably go out big most weekends and eat a lot of junk food. Exercise was never really on the agenda so I’d say it’s definitely made me healthier even though that often means ducking meeting up with friends and going out with work colleagues. Hopefully they’ll forgive me. What would you like to see changed so that people with ME receive better care? Lots of things…Better education of healthcare professionals and an abandonment of CBT, GET and a purely psychological approach. Governments to pledge proper investment into trials and research but with patients consultation and no ridiculous conflicts of interest or withholding of data. I’d like to also see a message pushed out to the mainstream that this is a very serious physical illness. Is there anything you’d like to say to the Dutch ME patients community? Just that having been to the Invest In ME conference and watching Ron Davis, Fluge, Mella, Hornig and co talking about their work, I’m convinced that if we all keep working together, they’ll find a cure very soon. Don’t lose hope, there’s a lot of people out there who care, we all just need to keep on pushing the message and adding to the pressure in whatever small way we can. Please help Mike to reach his target by donating to this amazing campaign. Please click on the following link. Thank you so much for this interview Mike!!!! Anil van der Zee, Frank Twisk and Rob Wijbenga were interviewed by Mike as well. Click here to read more about what it’s like to be living with ME in the Netherlands. Click here to read Mike’s blog about meeting me. “Well Man Meets Severely Ill M.E Man“. Previous Post For patients with CFS, going to the bathroom is similar to running a marathon.